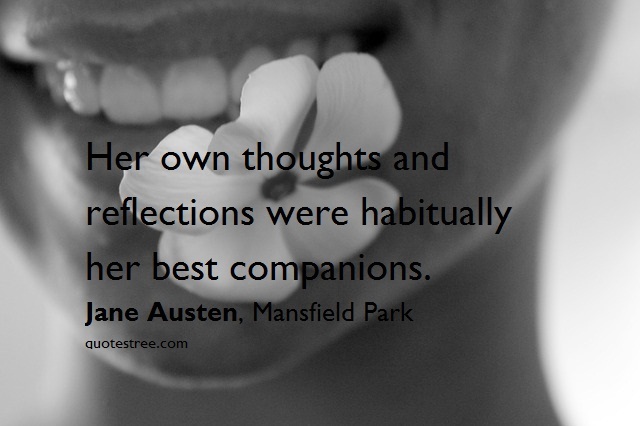 Mansfield Park is the third novel by Jane Austen, after Sense and Sensibility, and Pride and Prejudice. A fondness for reading, which, properly directed, must be an education in itself. There is no reason in the world why you should not be important where you are known. You have good sense, and a sweet temper, and I am sure you have a grateful heart, that could never receive kindness without hoping to return it. I do not know any better qualifications for a friend and companion. An engaged woman is always more agreeable than a disengaged. She is satisfied with herself. Her cares are over, and she may exert all her powers of pleasing without suspicion. All is safe with a lady engaged; no harm can be done. Everybody is taken in at some period or other. I do not pretend to set people right, but I do see that they are often wrong. Her own thoughts and reflections were habitually her best companions. She was not often invited to join in the conversation of the others, nor did she desire it. Her own thoughts and reflections were habitually her best companions. Everybody likes to go their own way–to choose their own time and manner of devotion. It was a gloomy prospect, and all that she could do was to throw a mist over it, and hope when the mist cleared away, she should see something else. Those who have not more must be satisfied with what they have. You must really begin to harden yourself to the idea of being worth looking at. Human nature needs more lessons than a weekly sermon can convey. Every moment has its pleasure and its hope. If I am missed, it will appear. I may be discovered by those who want to see me. I shall not be in any doubtful, or distant, or unapproachable region. Her mind was all disorder. The past, present, future, every thing was terrible. He was in love, very much in love; and it was a love which, operating on an active, sanguine spirit, of more warmth than delicacy, made her affection appear of greater consequence, because it was witheld, and determined him to have the glory, as well as the felicity of forcing her to love him. You have qualities which I had not before supposed to exist in such a degree in any human creature. You have some touches of the angel in you. Good-humoured, unaffected girls will not do for a man who has been used to sensible women. They are two distinct orders of being. When you give me your opinion, I always know what is right. Your judgment is my rule of right. Varnish and gilding hide many stains. [N]obody minds having what is too good for them.